DELL PowerEdge R710 CTO Rack Server. Tested / Preinstalled with VMWARE ESXI. 6.5 on 8GB USB (included). Rack Rails: Not Included . Server Options / upgrades . Backplane: 1x 6 Bay 3.5” LFF SATA /SAS /SSD. 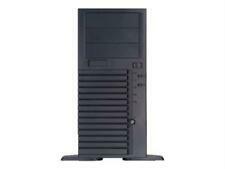 Dell T610 5u Rack server, can be used as a tower server also. 48gb DDR3 Up to 192GB (12 DIMM slots): 1GB/2GB/4GB/8GB/16GB DDR3 up to 1333Mhz. No HDDs, no caddies. 2x Dell PowerEdge Servers. R420 and R420. Condition is Used. PowerEdge R430 Server. Riser with Two x16 PCIe Gen3 L P slots (x16 PCIe lanes), R430. 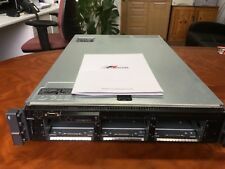 PowerEdge R430/R530 Motherboar d MLK. Dell EMC 1U Standard Bezel. Dell PowerEdge R720 Server (16 cores, 2.20 GHz, Hyper Threaded). - Processors: Dual, 2 x Xeon E5-2660 V1 (2.20 / 3.00 GHz, 8Cores, 16 Threads ). - Backplane: 16 x 2.5" SFF Hot-Swap Drive Bays (0 caddies included). Dell PowerEdge R610. Rack Rails kit: Yes, included. Server specifications. 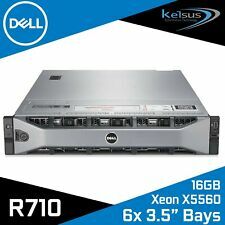 Dell R710 Server, 1 x Intel Xeon Quad Core E55504 @ 2.0GHz, 24GB Ram, 1 HDD (300GB) Condition is Used. Collection only. 5th coolig fan is missing. Cash on the collection please. Thank you. Dell Poweredge T620. Dell PowerEdge T620. 16x 2.5" Drive Bays (2x empty Caddies). We are able to source hard to find parts for Legacy systems through to the latest new in box parts for the latest generations of servers & storage systems. Dell Poweredge T110 II 2/i3 2100 3.10GHx, 8gb PERC S300, Tag 5WPT02 RD1000. Condition is Seller refurbished. Dell PowerEdge R715 Server. 2 x AMD Opteron 6282 2.6GHz / 256GB RAM / No Hard Drive. Location Reference: 27B. This is aGrade 3item. Dell poweredge R610. Condition is Used, working with no issues. Complete with adjustable rack rails, no front cover, no operating system included. 2 x 2Ghz dual core Intel E5504 cpu 2 X 250GB SATA drives 24Gb RAM. SAS6/iR raid controller, on board iDRAC. 2 x Xeon Quad Core E5420 2.5GHz / 16GB RAM / No Hard Drive. Dell PowerEdge 1950 Server. Location Reference: 27A. This is aGrade 3item. Storage: 6 x 2TB 7.2K SAS Drives (12TB RAW SAS STORAGE) . DELL PowerEdge R710 Rack Server. Tested with VMWARE ESXI. 6.7 Windows 2016 / windows 2012 HPC. Rack Rails: Not Included . 2 x 600GB 2.5" SAS Drives. Fully Tested. Dell Poweredge R710. DELL Poweredge Servers. Dell Poweredge 1950. Dell Poweredge 2950. Dell Poweredge R410. Dell Poweredge R510. Dell Poweredge R610. Dell Poweredge R810. 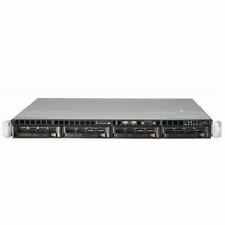 Dell PowerEdge R710 1 x 4-Core XEON 2.0GHz 8GB, Perc 6i, 6-Bay SAS 3.5"
Dell PowerEdge R710. 6 Bay SAS 3.5". 1 x 4-Core XEON 2.0GHz. No HDD's, Bezel, Rack ears or rails. Dell Computer Servers offer businesses value, great flexibility, and a wide selection of performance options. Whether they need an entry-level machine for businesses who've only recently migrated to server use or they need a server with real speed and caching power, more processors, and the flexibility offered by expansion and virtualisation, Dell has the server to meet that business's needs. Many affordable options can be found in this eBay collection. What are servers used for? A computer that serves files and information to other computers is a server. Other computers called clients can connect to servers via local area networks (LAN) or wide area networks (WAN) such as the internet itself. There are different server types that offer varying features with some working as file servers, mail servers, web servers, and more. Web servers can parse different scripting languages like ASP, JSP, PHP, and more and serves web pages to computers connected to it. Mail servers manage user email accounts and receive and send messages. File servers are storage centers accessed by connected computers within local networks and require authentication for access. 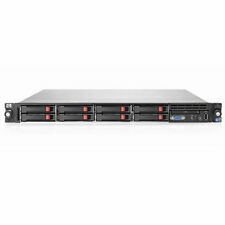 Offered on eBay, the right server can greatly increase a business's productivity. Web servers, unlike standard computers, don't utilise a keyboard, monitor, or mouse. Many also lack audio and graphics cards. Servers come with a network interface, high-powered processors, incredibly fast RAM, and several hard drives. The hard drives used in servers often operate at much higher speeds than those in standard desktop computers. With the combined power of the hard drives, processors, and RAM, the server has a lot more processing power and performance to offer than that of standard computers. How do you select the best server for your business? The Dell server your business needs largely depends on what you intend to use it for. If you merely need to set up a file sharing system, automated backups, and light remote access for ten computers or less, an entry-level, basic server should work just fine. If your business needs an email server, a server for managing printing jobs, managing a complex database, for running intricate sophisticated server-based apps like CRM or ERP, and you'll require generous storage capacities and/or sizeable virtualisation capabilities, a stronger, more full-bodied server option like a blade, rack, or tower server may be a better choice. These choices are available on eBay.